Finally, the new and improved itscamilleco.com is now live! We tried our best to keep the hiatus short and to launch this as quickly as possible. There are still a few minor kinks here and there but nothing that we can’t fix in a jiffy. So what do you think? I hope you love my blog’s new look as much as I do! 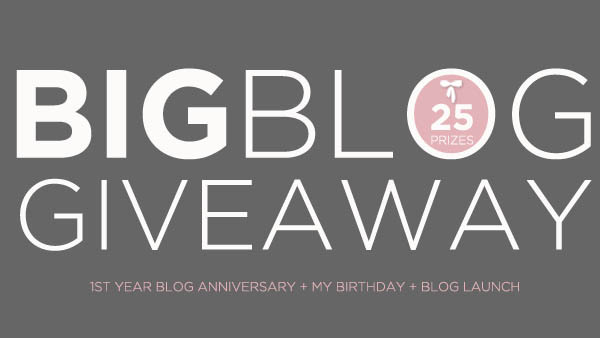 As promised, to celebrate this launch, my blog’s 1st year anniversary and my birthday, I’m throwing a HUUUUUGE blog giveaway–12 giveaways, 25 prizes! Consider this my little thank you for all the support you’ve given me. So here’s how you can win one of the prizes listed below. Follow me on Twitter and on BlogLovin’. Like the Facebook pages and follow the Twitter accounts of ALL the brands listed below, regardless of the prize you want to win. Remember, you have to have a Twitter account to qualify. Leave a comment below with your name, Twitter name and preferred giveaway number prize/s. Tweet this: “Itscamilleco.com is finally back up!!! I want to win the fabulous prizes she’s giving away! #ItsCamilleCoGiveaways” No need to mention/tag me. Good luck everyone! As usual, winners will be announced via my Twitter. Giveaway #1: 2 winners. 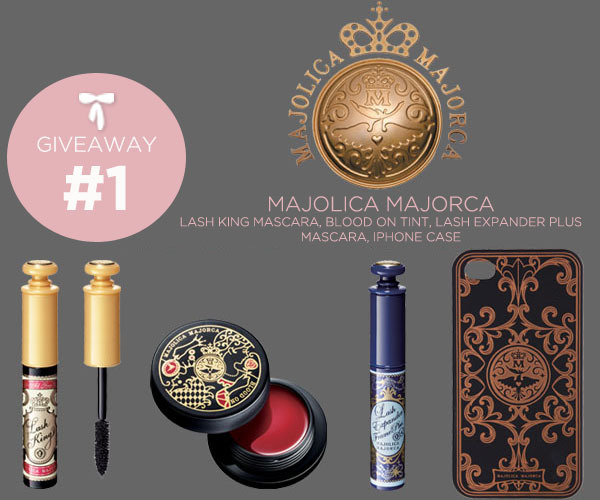 Each will receive 1 Lash King mascara, 1 Blood On tint (perfect for the beach), 1 Lash Expander Plus mascara and 1 Majolica Majorca iPhone case. Giveaway #2: 1 winner of Majolica Majorca press kit. 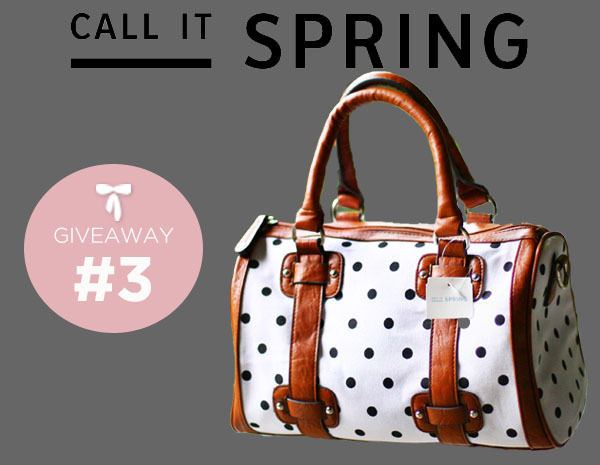 Giveaway #3: 1 winner of Call It Spring polka dot bag. Giveaway #4: 2 winners of P5000 worth of SM Accessories GCs each. 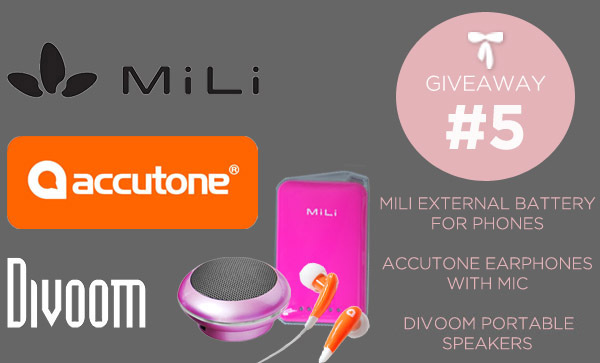 Giveaway #5: 1 winner of MiLi Power Crystal external battery for iPhone, iPod, Blackberry and other mobile phones, Accutone Aquarius in-ear headphones with mic and Divoom i-Tour Pop speakers. Giveaway #6: 3 winners. Each will get a pair of shoes of her choice from Comfit. Giveaway #7: 5 winners of 2 celebrity fragrances each from Bench and Kashieca. 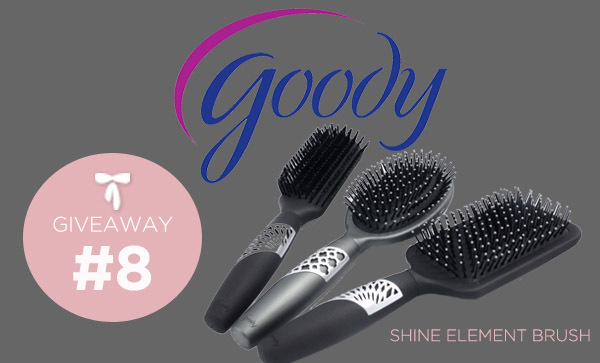 Giveaway #8: 3 winners of 1 Shine Element Brush each. Â Giveaway #9: 1 winner of 1 Soak Swimwear of her choice. hi ms camilel! :)) i just got your package. thank you soooo much! i’m so excited! God bless you more! Just send my replies to everyone! :) So sorry! Do you mind if I repost my comment/tweet? I don’t think it was posted. :( I promise! # 6 or #9 Thanks, and Happy birthday! Keep inspiring us through your blog <3 THANKS!!! Happy Happy Birthday Camille Co! More blessings to come. I love you and your style forever <3 I want to be like you someday. Best giveaway! Thankyou! Iâ€™d love to win 4, 6, or 9! More power to you, Ms. Camille! Giveaway nos. : 1, 2, 3, 4, 5, 6, 7, 8, and 9. in short, ALL! Haha. i really love your blog since then im so glad your back and a new improve one i so so LOVE it!! Preferred numbers: #3, #4, #6.
hey camille,wishing you a happy happy bday!hoping for lots of more fashion bday’s to come..more success! Hope to win one of those. Big Thanks! i’m a big fan of fashion bloggers like you. i’m hoping that you’ll pick me up. just a super advance birthday gift. (hahaha! :D) i want to be a blogger like you soon. and i’m looking forward that my first post would be one of the prizes that i could win here. numbers 4, 6 and 9. Like to win numbers: 1, 4 & 5.
i prefer #1, 3 , 4 , 6 AND 9. Love those thingy! Done following and liking everything! Preferred giveaways: ALL!! :D 1,2,3,4,5,6,7,8,9!! Preferred giveaway number prize/s: #s 4, 5 & 6. Preferred giveaway number prize/s: # 1, 2, 3, 4, 5, 6, 9! My name is Bea Almeida. Preferred giveaways are numbers 3, 4, 6 and 9. Giveaway #: 1, 3, 4, 5, 6 or 8. Preferred giveaway number prize/s : 1, 3, 4, 5, 6. I’ve bookmarked this site of yours since like, forever and I keep coming back on this post of yours wherein you made this pearly cream bride gown for Veejay Pilapil-Chavez . The design is very polished and detailed. The color is so sophisticated by itself that the lace adds all the drama. Ang bongga! Hahaha! :D I even saved some of your pictures so that I can learn more from fashion than what I already know. Been wanting to tell you that but I was shying around :> So. A bajillion thanks. Kudos to your fashion prowess! Happy Birthday Camille thank you for sharing your blessings with your followers! Wishing on #4 to share it also with my 15 year old daughter or # 9. Thank you! Advance Happy Birthday, Camille! Keep up the good work! I wanna win giveaways #1, 2, 3, 4, 6, 7, 8, & 9! All done! Congrats to your new and very lovely itscamilleco.com! What a cozy design. I really love the every piece of it. Hahaha. (No lies!) Wish yo all the best and for this blog. You’re really a great blogger. God bless and more powers! Giveaway number: 1, 2, 3, 4, 6, 7, 8, 9!! You have a lovely layout!! God bless. Good luck to all! I wish I can win this time hehe. Congrats to your updated webiste! sorry i mistakenly typed the wrong giveaway number i want to win..
give aways # 1, 2, 3, 5, 6. #3, 4, 5, 6, 7 and 9. Numbers 1, 3, 4, 6 and 9! I love giveaways #1,#2,#4 or #6! preferred giveaway number prize/s: #1-36.. But I would love to receive #4 the most! Preferred giveaway number prize/s: #2, #3, #6, #9! I love your blog’s new look, btw! – super nice and GORGE blog you have Ms. Camille :) two thumbs up! Preferred Price : #’s 1, 2, 3, 4, 6 and 9. Preferred giveaway: #6, #11, #12. Preffered prize: 4 or 6. I love the new look of your blog! \:D/ Your giveaways are really overwhelming. Preferred giveaway: #1, #4, and #5. Preferred Prizes: #1, #2, #3, #6, & #9.
love the new look of your blog :) Congrats ms.camille ^^ . name: Ma. Aiza Rose Abunda. name, Twitter name and preferred giveaway number prize/s. PREFERRED PRIZES: 1, 2, 3, 4, 5, 6, 9. Hi!! So excited that ur finally back!!! ;) <3 all the giveaways.. I would love to win giveaways nos. 1, 2, 3, 4, 6, 9. #’s 3, 4, 5, 6, and 9. Preferred Giveaway: #s 1, 2, 3, 4, 6, 8, 9. **sorry, wrong spelling of twitter name. Giveaway # 4, 5 or 6. Preffered giveaway #’s: 1, 2, 5, 6, or 9. Congrats on your new blog! It’s so pretty! And your giveaway is tromendously fabulous! Preferred giveaway/s: #s 1, 3, 6, 9! Happy Birthday and Happy Anniversary! :) God Bless. I know it’s a lot but I’d really be happy if i won one of these! Your new site looks very chic! Wow! Thank you for all of these wonderful giveaways, Miss Camille! Preferred Giveaway Number Prizes: 1,2,3,4,5,6,7,8,9! I love the numbers, 3, 4 and 6! Hi Camille! Since my Twitter account @myreindrops is currently suspended, I used another account to follow again the sponsors. Giveaway #3:Call It Spring polka dot bag. Giveaway #5: MiLi Power Crystal external battery for iPhone, iPod, iPad, Blackberry and other mobile phones, Accutone Aquarius in-ear headphones with mic and Divoom i-Tour Pop speakers. Giveaway #6: pair of shoes of her choice from Comfit. Giveaway #4: P5000 worth of SM Accessories GCs each. Giveaway #9: 1 Soak Swimwear of her choice. Fingers crossed that I’d win! :) It would be so amaaaazing! love the new look!! so cute <3 Joined. I love the new look of your site! More power Camille!